You don't need to live near the Superdome to recognize the significance of the iconic NFL stadium to the people of New Orleans. Formerly the Louisiana Superdome, the Mercedes Benz Superdome is located in the Central Business District in Downtown New Orleans, a brisk walk or quick streetcar or cab ride away from Deanie’s Seafood Restaurant and the New Orleans French Quarter. The Superdome is home of the New Orleans Saints, who kick off the regular season Sept. 11 against the Minnesota Vikings, the Allstate Sugar Bowl, the Bayou Classic and the Sugar Bowl Prep Classic. You don't need to live near the Superdome to recognize the significance of the iconic NFL stadium to the people of New Orleans. When the New Orleans Saints (0-2) take on the Atlanta Falcons (1-1) Monday night, the game will also mark the 10-year reunion of the broadcast record-breaking Monday Night Football matchup between the Saints and Falcons that marked the return of the Mercedes Benz Superdome following the devastation wrought by Hurricane Katrina. 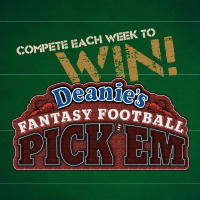 Sept. 7, 2014 - This NFL season, Deanie’s Seafood-host to Saints Radio Network’s “The Point After” show live from Deanie’s in the French Quarter-introduces the Deanie’s Seafood Fantasy Football Pick’em, a weekly challenge testing your football NFL smarts for the chance to win great prizes. NEW ORLEANS-September 6, 2014-Deanie's Seafood Restaurant in the French Quarter, 841 Iberville St., kicks off another season as Saints Radio Headquarters with live broadcast of Saints Radio Network's “The Point After” Show beginning with the season opener matchup of the New Orleans Saints and Atlanta Falcons on Sun., Sept. 7 in Atlanta. Again this season, Deanie's Seafood is host to "The Point After" radio show featuring former New Orleans Saints quarterback Cajun Cannon Bobby Hebert and commentator Big Chief Deke Bellavia that broadcasts live on the Saints Radio Network immediately following every New Orleans Saints game. NEW ORLEANS--Oct. 18, 2013--The New Orleans Saints, 5-1, will face the Buffalo Bills on Sun., Oct. 27, and Deanie's Seafood Restaurant will have all the post-game analysis after the Dome goes dark. The Saints will be coming off a bye week after their first loss of the season against the New England Patriots. Come out and join the Who Dat Nation at Deanie’s Seafood in the French Quarter or Bucktown to catch the action and take advantage of Game Day drink specials. 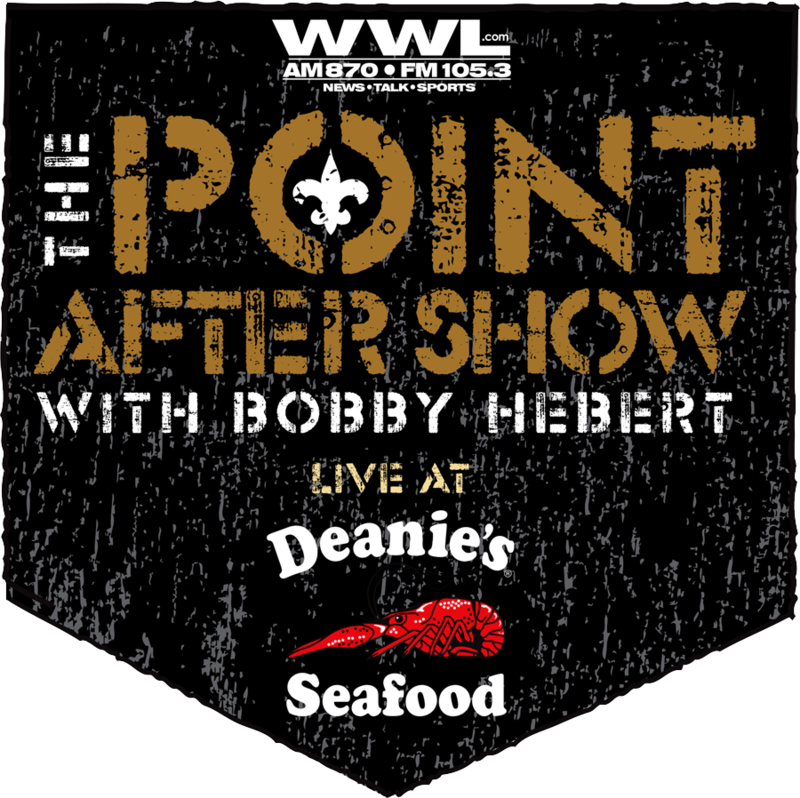 Once the game is over, join us for “The Point After” Show with Bobby Hebert live from Deanie’s Seafood in the French Quarter. Both Deanie’s locations have large screen TVs tuned to the game, so Saints fans can enjoy their favorite seafood without missing a play. NEW ORLEANS--Sept. 24, 2013--Monday Night Football is back in the Big Easy! Come out and join the Who Dat Nation at Deanie’s Seafood in the French Quarter or Bucktown, as our undefeated New Orleans Saints take on the undefeated Miami Dolphins in the Mercedes-Benz Superdome. 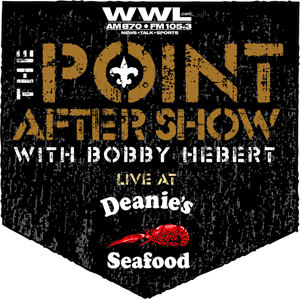 Once the game is over, join us for “The Point After” Show with Bobby Hebert live from Deanie’s Seafood in the French Quarter. Both Deanie’s locations have large screen TVs tuned to the game, so Saints fans can enjoy their favorite seafood without missing a play. Be sure to take advantage of our Game Day drink specials!